If you want an October weight loss calendar 2012 to help you stay on track and achieve your ideal weight, print it and start using it. It is never too late to start a diet. Do not wait any longer. Go ahead and get started. 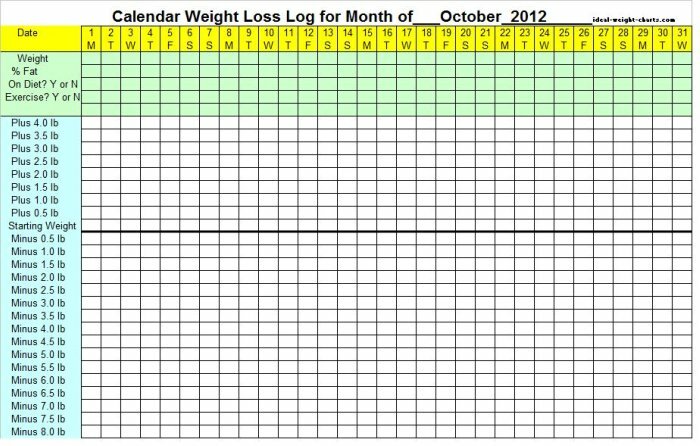 If you would like to print this October weight loss calendar 2012, set up your printer in landscape. If that does not work, try the pdf format below. No matter whether you use one of these free weight loss calendars or pay for the real preprinted calendar below, You really should start using one of these calendars. Remember the old adage: "To measure is to manage." Start managing your weight loss today.